Hubzu, an online real estate sales and auction marketplace, today announced two new features that ease the homebuying process for traditional buyers looking to purchase bank-owned homes. Pre-auction listings allow buyers to research properties before an auction, while FHA rehab financing on qualifying homes bundles the price tag and renovation costs into a single mortgage. Homes that euphemistically need “a little TLC” don’t always fall under the renovate and sell-for-profit spectrum in the eyes of a consumer. For some buyers, distressed properties present the opportunity to apply or hire some elbow grease and actually stay awhile — perhaps in a location they never would have been able to afford otherwise. Hubzu, an online real estate sales and auction marketplace, today announced two new features that are designed to ease the homebuying process for traditional buyers looking to purchase bank-owned homes: the ability to discover upcoming listings before auctions begin and the opportunity to use Federal Housing Administration (FHA) rehab financing. “With home prices rising and inventory being very tight, many homebuyers and their agents would be well-served to consider bank-owned homes as a more affordable way to purchase a home,” Hubzu president Steve Udelson told Inman in an email. Hubzu also surveyed over 2,000 of its users earlier this year about the current state of the REO (real estate owned) landscape and found that nearly one in five homebuyers plan to occupy a bank-owned property they purchased, Udelson said. “We want to serve the needs of this audience and hope these new offerings help increase the size of this group over time,” he added. 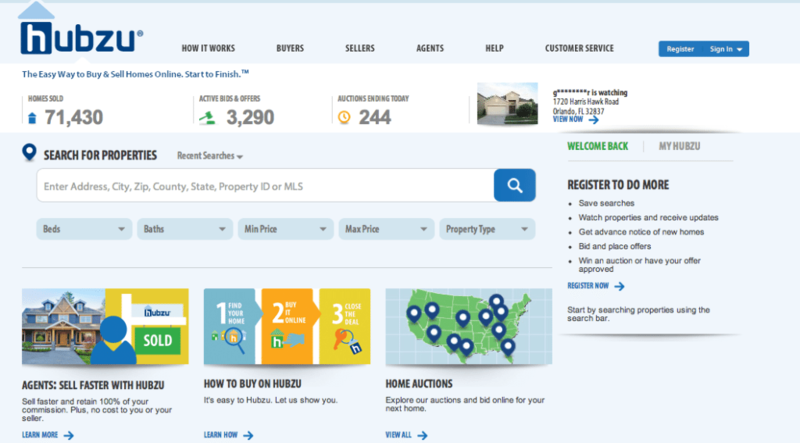 Hubzu rolled out two new features to its real estate sales and auction services platform. Screen shot of Hubzu auction page. Like having the chance to study for a test before you place your bets on a multiple choice answer, buyers on Hubzu can now preview, monitor and research properties before a live auction commences. Calculating the potential of a distressed home and whether you’ve got the resources to make it livable can be difficult to manage without the right expertise. FHA 203(K) loans under the Department of Housing and Urban Development (HUD) bundle the home purchase price and renovation costs into a single mortgage. On qualifying homes, Hubzu users can now place bids contingent on rehab financing, which “opens up substantial opportunity” for distressed-home buyers, the company said. Namely, it prevents buyers from having to obtain a separate loan for renovations and risk rehab financing falling through after they take on a mortgage, and gives consumers who don’t have the cash upfront a better chance at securing a bargain fixer-upper. “The rehab financing program in particular will help home buyers feel more confident when they are bidding on homes, and we believe it will strengthen neighborhoods as well,” Hubzu president Steve Udelson told Inman in an email. Launched in 2009 as GoHoming.com, Hubzu has facilitated the sale of more than 149,000 homes, the company says. The sales and auction site rebranded in 2012 and is operated by Altisource Portfolio Solutions S.A., a service provider to mortgage lenders, investors, mortgage bankers, credit unions, financial services companies and hedge funds. Hubzu opened up its services for licensed brokers and agents and non-REO properties in February 2013. Buyers on Hubzu, who are charged a $299 technology fee and “buyer’s premium” ranging from $625 to 5 percent of the home’s value, are the biggest source of revenue for the site — but only pay upon sale. According to Udelson, Hubzu saw a 22 percent increase in sales from 2014 to 2015, and registered users increased by 27 percent in 2015 over 2014. Moreover, Hubzu also saw a 21 percent increase in unique users (those placing a bid/offer) year-over-year.